This is the topic of the day. It’s like online dating, but better. You already know what they like/ hate, so you’ll have a good idea if you’re compatible. 1. If someone likes your photo, do you go check out their profile and like a photo of theirs? 2. Is someone leaves you a comment, are you expected to write back a “thank you”? What if there are like 204 comments? This has obviously never happened to me. 3. If someone “follows” you, do you feel obliged to “follow” them back? 4. To credit a photo, do you tag them or list them in the caption? Haha, I love this post. I have had many of the same questions! I don’t know if I have any real answers, but I can give you my impressions. 1. Q: If someone likes your photo, do you go check out their profile and like a photo of theirs? 2. Q: Is someone leaves you a comment, are you expected to write back a “thank you”? What if there are like 204 comments? This has obviously never happened to me. A: Again, I think nice, but not always necessary (definitely not necessary if there are a ton of comments). I try to say thank you, especially if it’s a detailed comment, but if it’s basically just a thumbs up emoji or something, I don’t always comment back. Sometimes I wonder if it’s worth it to trouble the other person with an notification just to see that I said, “Thanks!” Maybe I’m overthinking it. 3. Q: If someone “follows” you, do you feel obliged to “follow” them back? 4. Q: To credit a photo, do you tag them or list them in the caption? If you start a social media etiquette series, please sign me up! There’s no telling who all I’ve been offending on here. Love Instagram but I’m very likely doing it all wrong. Most times I do check out a person’s profile – especially if I see I have a new follower or someone new to me has “liked” a photo. I’ve found so many great feeds this way. I don’t always follow back or “like” a photo in return. I do try to reply to comments I receive, though to be honest, I’m also not racking up 200 comments at the moment. To tag a photo, I’ve typically given credit in the caption to the photo. Instagram peeve: All the international “call girl” type spam I’ve gotten. I mean… don’t they filter to spam people who would be more likely within their audience? How do these people find me?! Love the new format BTW! Dude, I know. I have to report all those spammy girls. Thanks for noticing the new format. I like it too….cleaner…more graphic right? Miss you! Love the new look you’ve got going on here too! Change is exciting. I am recently loving Instagram in such a new way. I appreciate the dialog you’ve got going on here as I ask myself these questions too. I like to pretend that there are no rules, only best practices. At my core I think we should all use the platform in the way that brings us the most joy and that can be different from user to user. Personally, I’m excited to be thinking more stylistically about my cell phone shots and I’m recently getting energized by this idea that my caption can be a bit more of a micro-format blog post if I’m feeling wordy. I rarely if ever take the time to @tag folks to say thank you when they comment, though I do appreciate every single one so much. Perhaps I should – just for the feelgood that it sends to the other user, to let them know that I am grateful and ready to engage. But as a default, I don’t have an intuitive response trigger to this, b/c I’m not adding anything to a conversation. Uh… that’s probably a bad way to think about it. I may now think about this differently. I’ve always felt inadequate when it comes to small talk. I’m not into the trading like for like or follow for follow thing either. I’m pretty protective of my stream with Instagram. I believe this is due to the chronology shotgun of content and me being one of those crazies that wont stop scrolling until I’ve seen something that I saw last time I was scrolling. I can’t go mucking up the feed by following just anyone, but I check them all out. I spend far too much time going down the rabbit holes 😉 I try to keep it edited to accounts that I’m inspired by at the moment. Any tag, any way is good, but if I had to choose, I like the @tag in the caption, since its actionable and leads you to the photographer’s personal stream for more! Thanks for letting us all respond long and loud on your blog! Thank you so much for taking the time to write such a thoughtful comment, which is very thought provoking to me. This is why I love the blogsphere. I soooo agree with your sentiments. 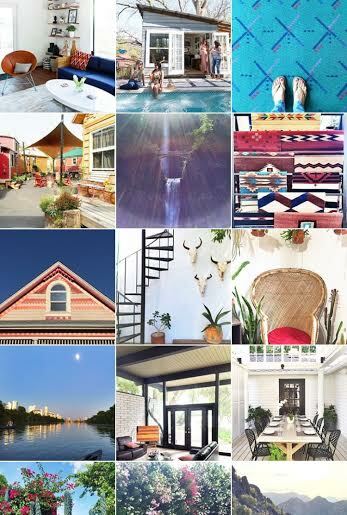 I for one am very thankful that Instagram exists because it’s been such a great way to meet people in Austin – yourself included! – I check out a profile if someone likes a photo of mine and will like a photo if in fact I find one I like. – If someone leaves a comment I always go back and reply (I use Iconosquare to manage comments online). – I don’t feel obligated to follow back unless I really like what they’re posting. I’ve noticed that many followers are faux followers. They follow or bulk like photos so that you’ll take notice of their profile and follow them. Then a week or so later, they unfollow you, but have gained you as a follower. – For credits I mention them in the caption since it’s more prominent and not everyone taps (unless it’s articles of clothing). Yes, yes, yes and yes. Thanks sweet neighbor! Yes ma’am!! And amen! Have loved meeting you! !